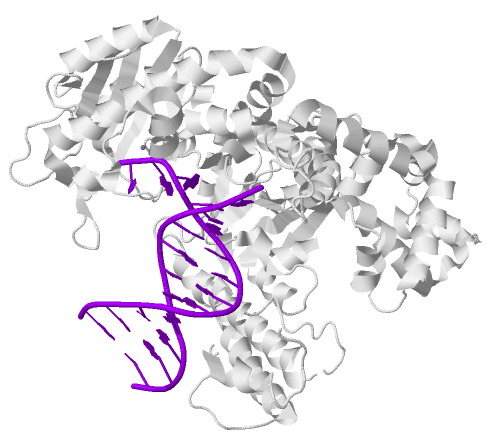 On April 16, 1956, about 60 years ago, Arthur Kornberg and his team of biochemists were the first to isolate and later characterize the enzyme which is now known as DNA polymerase I.
Arthur Kornberg, who is widely perceived as one of the giants of twentieth century biochemistry, was an exceptional student, who entered college at 15 and graduated four years later with a bachelor in chemistry and biology. While at medical school at the University of Rorchester he published his first paper in the prestigious Journal of Clinical Investigation. A paper on the Gilbert’s disease, which afflicted Kornberg himself, opened the door for Kornberg to the National Institutes of Health (NIH) in 1942. After initially working on vitamin metabolism, Kornberg recognized the opportunities in the relatively new and advancing field of enzymology and joined the research group of the acclaimed biochemist Severo Ochoa. Following his motto “Never a dull enzyme” he purified and characterized various enzymes including malate dehydrogenase, aconitase, and especially potato nucleotide pyrophosphatase. This enzyme marked the first step in clarification of nucleotide synthesis and the coenzymes involved, and spurred his interest in the biochemical mechanisms behind DNA replication. At the time of Watson and Crick’s proposal of the double helical DNA structure, the deoxynucleotide precursors of DNA were still unknown and many regarded DNA synthesis as a “vital” process, inseparable from the living cell. Kornberg would prove them wrong by discovering DNA polymerase, the necessity of a DNA template in addition to deoxynucleotides and primers, and the 3′→5′ error correcting mechanism of the DNA polymerase I. For their elucidation of the enzymatic process of DNA synthesis Kornberg shared the 1959 Nobel Prize in Physiology or Medicine with his former mentor Severo Ochoa. By replicating infectious circular single-stranded bacteriophage φX174 DNA in vitro, Kornberg demonstrated in later works, that the synthesized DNA was biologically active. He had married in 1945 and his sons Roger David Kornberg, Thomas B. Kornberg, and Kenneth Andrew Kornberg followed impressively in their father’s footsteps. Roger received the 2006 Nobel Prize in Chemistry for describing the role and structure of RNA polymerase II and Thomas discovered DNA polymerase II and III in 1970. Arthur Kornberg and his students have achieved one of the greatest feats in experimental science by elucidating, as he himself put it, “the replication of the E. coli chromosome from start to finish”. The once revolutionary synthesis of DNA and RNA in vitro has now, in large part due to the work of Kornberg and his colleagues, become one of the most important and regularly used techniques in molecular biology and biochemistry.